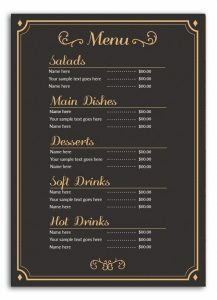 Sick of looking at bland, unattractive menus? Incorporate your restaurant or bar branding into your menus with our expert team of dedicated design professionals who will help you to create stunning, customer focused menus, which catch your customer’s attention and excites them to buy from you. We can even assist you with the wording and presentation of your copy, just to make sure that every aspect of your menu sells quality.